Data from tables in 1930 Locomotive Cyclopedia. See also DeGolyer, Vol 81, pp. 433+ Works numbers were 61013-61017, 61060-61072, 61091-61101 in September 1929 and 61123-61127 in November. As built in 1929, these dual-service engines had an outside-cradle frame (also known as a banjo frame) holding the 4-wheel trailing truck. While needed to clear the large ashpan, says Drury (1993), this frame was a weak point. The first five were delivered with Baker valve gear; the rest had Walschaerts. Other features included 14"-diameter piston valves; a firebox fitted with combustion chamber (116 sq ft/10.8 sq m), thermic syphons (129 sq ft/12 sq m) and firebrick tubes (21 sq ft1.95 sq m). Two of the thermic syphons were placed in the firebox, the third "centrally located' in the combustion chamber. Boiler served by Worthington Type S feedwater heater and Standard Type B (modified) stoker. As built, these engines had a Franklin booster that added 11,300 lb to starting tractive effort. 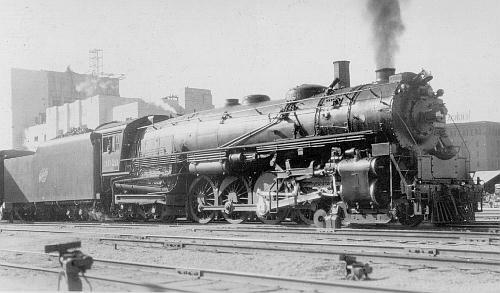 These were huge engines that initially were restricted to the Chicago-Omaha main line. Drury notes two rebuilds. 1940 introduced roller bearings on the axles, lighter Boxpok drivers, and lighter main and side rods. Locobase 3582 describes the much more extensive reconstruction wrought on 24 locomotives beginning in 1946. Data from C&NW 10 - 1952 Locomotive Diagrams. 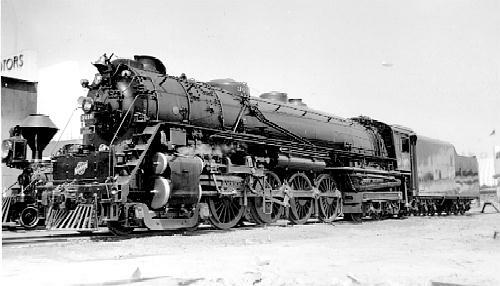 As noted in Locobase 252, the H-class 4-8-4 went through two major rebuilds during their careers. The first, in 1940, is described in 252. In 1946, 3004's refit went substantially farther with a new boiler mated to a new firebox and mounted on a cast nickel-steel frame with integral cylinders, air reservoirs, and pilot beam. Tube and flue diameters both increased, (from 2" and 3 1/2", respectively), but their number decreased and total evaporative heating surface declined by a total of more than 1,300 sq ft (120.77 sq m). Essentially, these were new locomotives. Drury comments that the rebuild "...was a much better engine than it had been in 1929, and it had been an excellent engine then." 24 were modernized by C&NW in 1946-1949 before dieselization stopped the program. They left service beginning in 1950, the last departing in 1956.